It’s an app-driven power tool. It’s a portable 3D cutter. ShopBot Tools today (June 27, 2013) launched a Kickstarter crowdfunding campaign (handibot.com/fund) to support development and distribution of its latest hardware innovation, the Handibot™ smart power tool. This 30-day campaign hopes to raise $125,000, and one of the main rewards for contributors is to get a first-run Handibot Smart Digital Power Tool six weeks after the close of the campaign. The Handibot™ Smart Power Tool won an Editor’s Choice award in May when it was introduced at MAKE Magazine’s Hardware Innovation Workshop. It is a portable robotic power tool designed to enhance creativity and productivity at construction and remodeling jobsites, in rapid prototyping, and in countless DIY projects. The Handibot tool features an App-Driven, one-button “Start;” it can be run from a smartphone or tablet, as well as from PC’s. If you’ve heard of 3D printers, then think of the Handibot as a ‘3D Cutter’ — you can use the Handibot to cut, drill, and carve in wood, plastic, and aluminum with computer-controlled precision. To see video of the tool at work, visit www.handibot.com. 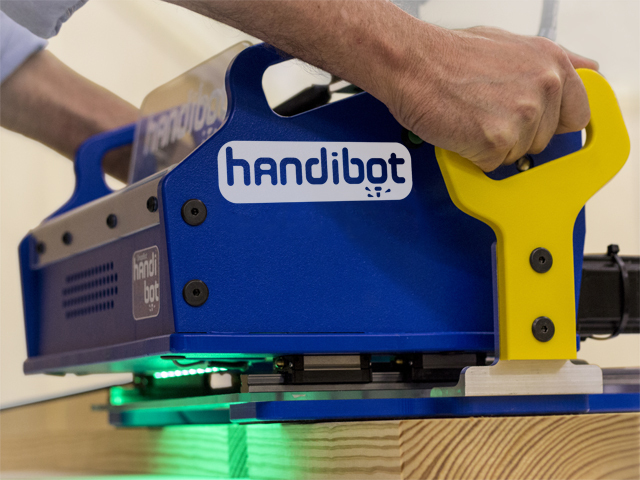 The Kickstarter campaign will fund an initial production run of Handibot power tools by ShopBot, and also enable development of a web-based eco-system where anyone with ideas for apps can collaborate with app developers in an open source software and hardware environment. “One company can’t possibly come up with all the interesting job apps that can be put to work with a Handibot tool,” Ted Hall explains. “So we look to the crowd to think of apps for the tool and work together in developing them.” See the campaign at handibot.com/fund. What would YOU do with a Handibot smart tool? ?